Officials from NBC Sports, where he covered five Olympic Games as well as 33 editions of the Tour de France as a commentator, sent a message of condolences. Sherwen’s contribution to cycling is immeasurable. In the 1970s and 1980s, he was among a new wave of Anglo riders breaking into the European peloton. He turned pro in 1978 and twice won the British national title. He raced seven editions of the Tour and retired in 1987. This summer, he celebrated his 40th Tour de France — including 33 as a commentator — while working with the NBC crew. Sherwen also worked as PR for the Motorola team, where a young Lance Armstrong was first making his mark, before moving into the announcer’s booth. 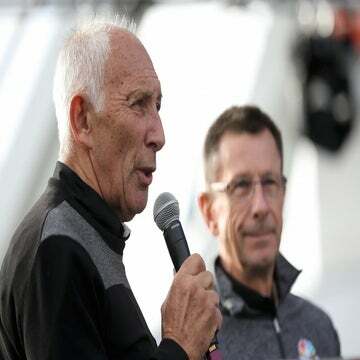 Coupled with longtime partner Phil Liggett, the pair became synonymous with professional cycling among the burgeoning English-speaking market. Sherwen won kudos for his insider knowledge, close relationships with riders and sharp commenting skills. Early on Monday, Liggett tweeted that Sherwen had died of heart failure, according to the deceased’s family. A British native, he had strong roots to Africa. He spent part of his childhood in Africa when his father had a job in Uganda, and he later lived in Uganda for most of his adult life. He was once part owner of a gold mine and often promoted African cycling and tourism among friends and colleagues.